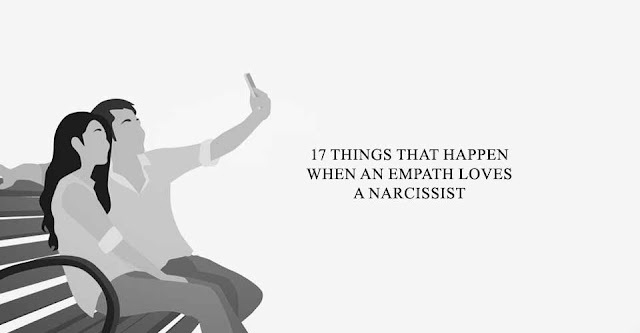 17 Things That Happen When An Empath Loves A Narcissist. THERE HAS NEVER BEEN A MORE TOXIC UNION, THAN THE RELATIONSHIP BETWEEN AN EMPATH AND A NARCISSIST. Empaths often are misunderstood as being weak, or victims of their kindness. That’s not the case at all. Empaths are strong, resilient individuals who are highly sensitive to the feelings and emotions of others. However, when narcissists enter the picture, “victims” are exactly what empaths become, if they don’t know how to protect themselves and create boundaries. Empaths want to heal the world, and can’t stand to see someone in pain. Because of this, they are naturally drawn to the irreparably damaged narcissist and their tales of woe. But a narcissist doesn’t want to heal- a narcissist wants to manipulate, belittle, and most of all, continue to be a narcissist. Even though yes, most empaths are already aware that being in a relationship with a narcissist is an unhealthy decision, they might not know exactly what they are in for- until now. 1. The narcissist creates a sense of comfort for the empath. An empath will feel a strong connection to the narcissist, even if he or she does nothing to reassure the empath that their feelings are correct. 2. Empaths love to love. They enjoy making other feel “whole” again. But there is a problem…the more love and care an empath gives, the more powerful and in control a narcissist becomes. 3. The narcissist will make the empath feel like the relationship is going well, but what is really happening is the narcissist is seeking constant validation. They ask “you love me, right?” and swiftly turn any (and every) conversation into one about themselves. 4. After a while, the narcissist will begin to use “gas-lighting” tactics to make the empath feel enormous self-doubt. “I never said that,” “you’re crazy,” and “you’re imagining things” are common phrases that start the rapid decline of an empath’s mental stability. 5. This creates a relationship of control for the narcissist. They leave the empath feeling reliant on them for everything- they begin to feel like no one else would want them. 6. All of these manipulation tactics and control mechanisms cause many empaths to experience severe depression and anxiety. This only furthers the empath’s belief that they “need” the narcissist in order to feel okay. They alienate themselves and the narcissist becomes their entire world. 7. Everything a narcissist says and does is a direct attack on your personal reality. They can take you from the joy and normality that you once had in your life, to a shadowy place where feelings of inadequacy and worthlessness are daily occurrences because everything you do is wrong. 8. At some stage in the relationship, the empath will reach their breaking point. The person they once were becomes someone else…and their friends and family no longer recognize them. 9. Conflict in the relationship arises between the empath and the narcissist because the empath starts to take on the traits of their partner. Eventually, they begin to realize that their emotional needs are not being met, and display actions that say “my needs matter too.” The narcissist sees this as selfish behavior. 10. What neither member of the relationship realize, is that even after it ends (which it will), both parties continue to suffer. The narcissist will continue on to other, equally toxic relationships, and pursue various avenues in their life- but they will still be miserable. 11. And the empath will continue experiencing the abuse from a narcissist because it works like a poison in their mind and body. It enters every cell with one purpose- to destroy the reality of their target. 13. However, the empath doesn’t realize something very important- there is nothing wrong with them, and they didn’t “fail” anything or anyone. In fact, there is something very right with them. They simply were manipulated, used and lied to by someone who had no remorse about hurting another individual. 14. This begins the empaths powerful transformation. It is a painful process, but so is being with a narcissist. They begin to understand that in order to grow , they must re-evaluate their “healing” process. Everyone is worthy of love, but not everyone is deserving of trust. 15. The empath will heal. It takes a realization that they too were broken and damaged, like the narcissist, but they are willing to recognize that-whereas the narcissist simply refuses to believe they could possibly be flawed or in need of anything (or anyone). 16. The narcissist will carry on, looking for their next victim, completely unaware that their unhappiness is caused by themselves. 17. The empath will grow from this experience, and recognize that parts of themselves they must protect, and balance, if they are to live a wiser, more enriched life. This article was republished from unisoultheory.com. You can find the original post here.